Captain Jack is a new card game for 3-6 players, which uses the four suits in an unusual way. Eight packs of cards with one coloured back are needed and four packs with a different coloured back! This sounds expensive, but I managed to find twelve decent-quality packs for less than three GB pounds. The Queens are removed from each pack. Queens are not used in this game. The Hearts suits are stripped of 7 s, 8 s, 9 s and 10 s. Only A -6 s are used in the game. The Clubs suits are stripped of 9 s and 10 s. All Spades and all Diamonds are used in the game. The remaining cards are thoroughly shuffled to make a stockpile in the centre of the table. The four packs are placed face down at the bottom of the stockpile; the remaining eight packs are placed face down on top of these. The whole pack is played through ONCE during the course of the game, although you can have a longer game by agreeing to play through it two or three times or whatever! A number of ‘ships’ equal to the number of players is needed. These can be actual little plastic ships, or can be pictures of pirate ships pasted onto cards; alternatively, the unused Queens stripped from the packs can be used as ships. An additional 24 tokens are needed to represent extra ships. 9 ‘seaworthiness’ counters per player in the game are also required. The ships are placed in the centre of the table along with the seaworthiness counters and the stockpile. 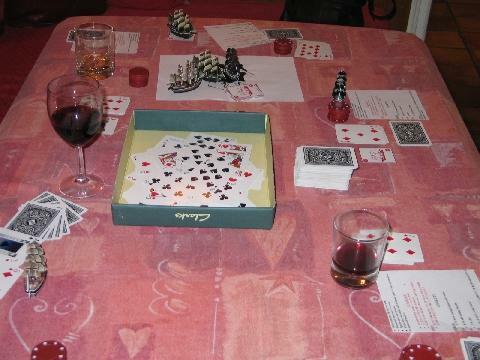 At the beginning of the game, each player is dealt seven cards. 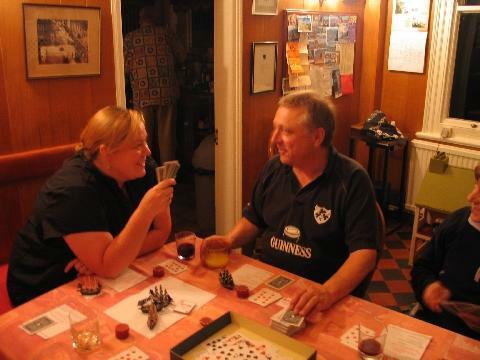 At the end of his or her turn, a player should always make up his or her hand to seven cards, except at the very end of the game when the stockpile has been exhausted and players are playing their hands out. 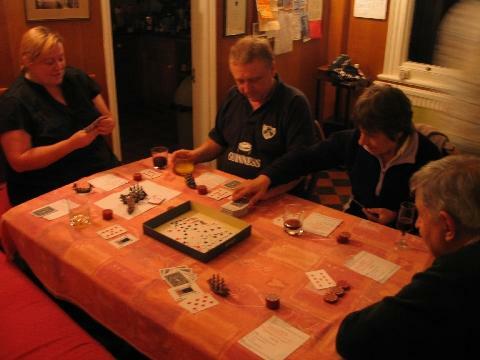 Each player’s turn divides into two stages. In the first part of his or her turn, the player lays down all Diamond cards from his or her hand (except Jacks and Kings which do not count as suit cards in this game). These cards form the player’s ‘treasure chest’. Next, any Ace of Spades should, similarly, be placed in front of a player. The Ace of Spades will allow a player to make two attacks in the same turn, after which it is discarded. If a player has a King and Jack OF THE SAME COLOUR (i.e. red or black) in his or her hand at the beginning of his or her turn, he or she can play these cards and announce ‘Captain Jack’. The cards are shown and placed in the discards pile. This entitles the player to take a ship token and 9 ‘seaworthiness’ tokens from the central pool. The number of ‘seaworthiness’ tokens in front of a player should never exceed 9. A player can claim as many ships as he or she is able during the game, but only one ship at any one time is the ‘active ship’. This means that, no matter how many ships a player has claimed, he or she never needs more than the 9 seaworthiness tokens attached to the current active ship. Any additional ship tokens are placed next to the player. Should the ‘active ship’ be sunk outright, however, the player can transfer to another ship in his or her ‘fleet’. When this happens, that new ship has all 9 seaworthiness tokens. However, whenever a ship sinks, the treasure from the sunken ship is temporarily lost and those diamond cards are placed in a face-up ‘sunken treasure’ pile. The above are the possible actions in stage one of the player’s turn. The player now takes cards from the stockpile to bring his or her hand back to a full-strength seven cards. ATTACK another player’s ship, using a Spades card. This action is only possible if a player has a ship! The Spades cards 2 -10 represent cannon fire. To attack another player’s ship, a player announces whose ship is being attacked and then plays a Spade card from his or her hand, announcing its value and placing it on top of the discard pile. The defending player must then play a spade card from his or her hand, if able to do so. Where the attacker has played the higher card, he or she causes damage to the opponent’s ship equal to the difference in the values of the two cards. The defender then loses that number of the ‘seaworthiness’ tokens from his or her ship. For example, if the attacking player played the 10 and the defender plays the 3 , then the defender would lose 7 ‘seaworthiness’ tokens, which are placed in the middle of the table, reducing his or her ship to 3 tokens. However, if the defending player plays the higher spade card, then damage is done to the attacking player’s ship, costing the appropriate tokens to the attacker, and the defence has been successful. If the cards are of equal value, then there is no result. If a ship is reduced to 0 tokens in an attack, it is sunk and all its diamonds are placed in the ‘sunken treasure’ pile. The ship token is returned to the central pool. If it does not sink, the successful attacking player may now play a club card (2 -7 ) and steal that number of diamond cards from his or her opponent’s ‘treasure chest’. (Note that the defending player does not do this). If there are not sufficient diamond cards in the defeated opponent’s ‘treasure chest’, then he or she must make up any difference with cards from his or her hand, up to a maximum of seven. These cards are ‘pressed crew’ and are placed in front of the attacking player who has captured them. These are only lost when a player’s ONLY ship is sunk, otherwise they remain in front of the player and count towards the final score at the end of the game. Each player then makes up their hand to the required seven cards, the attacker doing so first. REPAIR his or her own ship to make good any damage to his or her ship from a previous battle. This action is only possible if a player has a ship! To repair a ship, the player uses a Hearts card from the hand to restore lost ‘seaworthiness’ points to his or her ship, to a maximum of 9, from the token pool. A heart card in the hand, A - 6 , can be used to restore points equal to the card’s value to a damaged ship. For example, a ship which had sustained 7 points of damage and was now down to 2 points would be restored back to 8 points by playing a 6 . TRADE by discarding up to four cards and taking the same number of cards from the stockpile. This is the only action in this stage which is available to a player without a ship. SALVAGE from the ‘sunken treasure’ pile by playing Clubs cards from the hand, discarding these, and taking the same number of Diamonds cards from the ‘sunken treasure’ pile. This action is only possible if a player has a ship! Note that the pip-count of the cards is not important when using Clubs in this way, only the number of cards. Players (including defending players) now make up their hands to seven cards, if necessary, and the player’s turn ends.